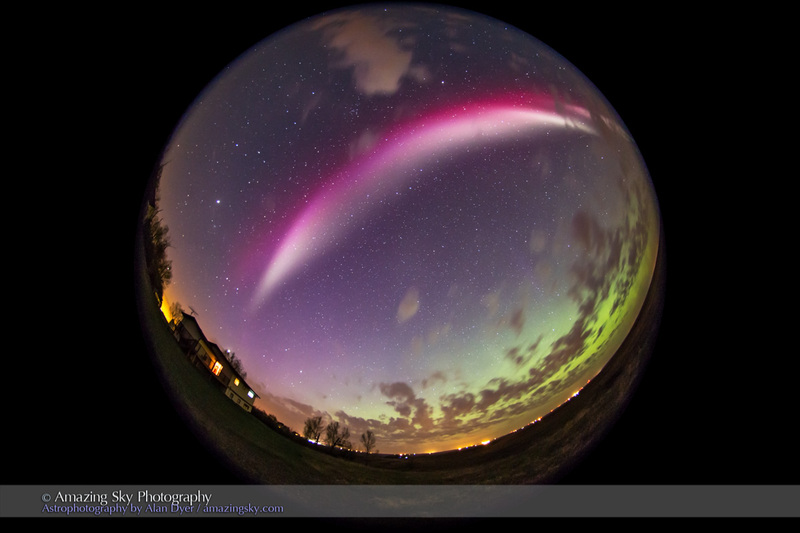 A strange red arc of aurora moved slowly across the sky on May 10. All indicators looked favourable early in the evening on May 10 for a good auroral display later that night, and sure enough we got one. But it was an unusual display. From my site in southern Alberta, the northern sky did have a diffuse glow of “normal” green aurora that never did take much form or structure. But overhead the aurora took the form of an arc across the sky, starting as an isolated ray in the southeast initially, then reaching up to arch across the sky with what looked to the eye like a colourless band. But the camera showed it as a red arc, with just a fringe of green curtains appearing for a few minutes. Be sure to click HD and enlarge the video to fill your screen. The time-lapse movie shows the sequence, over about 90 minutes, with 170 frames playing back at 12 frames per second. 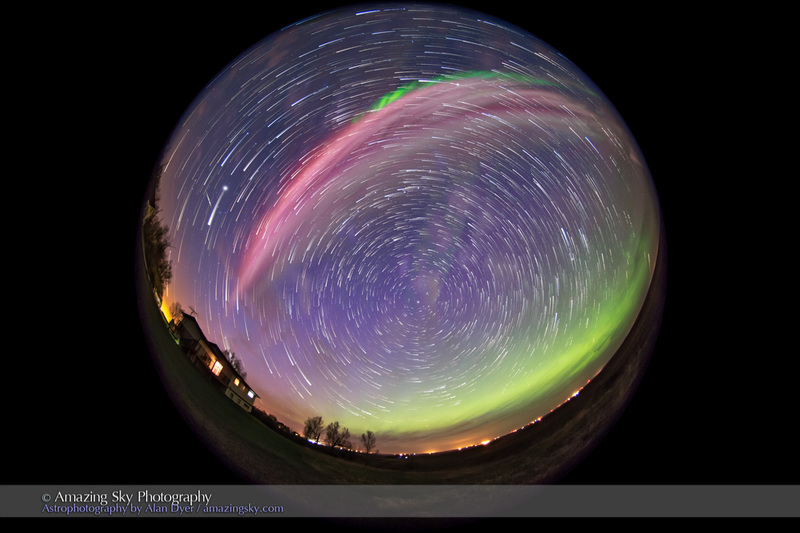 You can see the red arc develop, then become more narrow, then exhibit a few green curtains. Then it fades away. 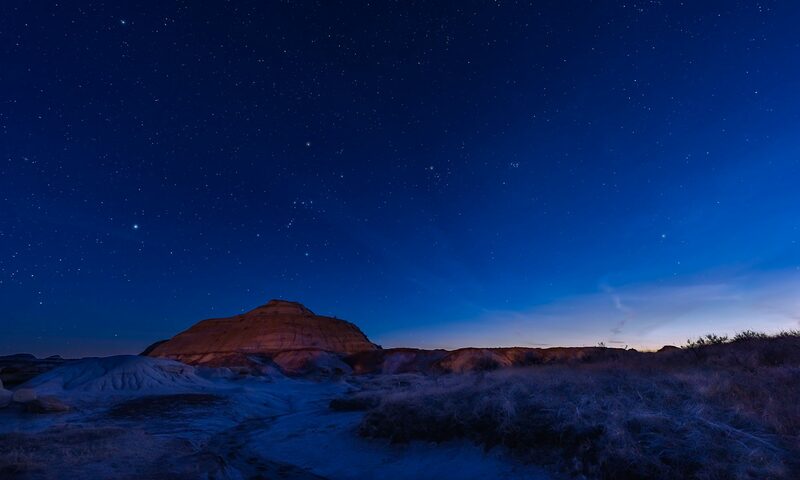 Large-scale pulses also brighten the whole sky momentarily. 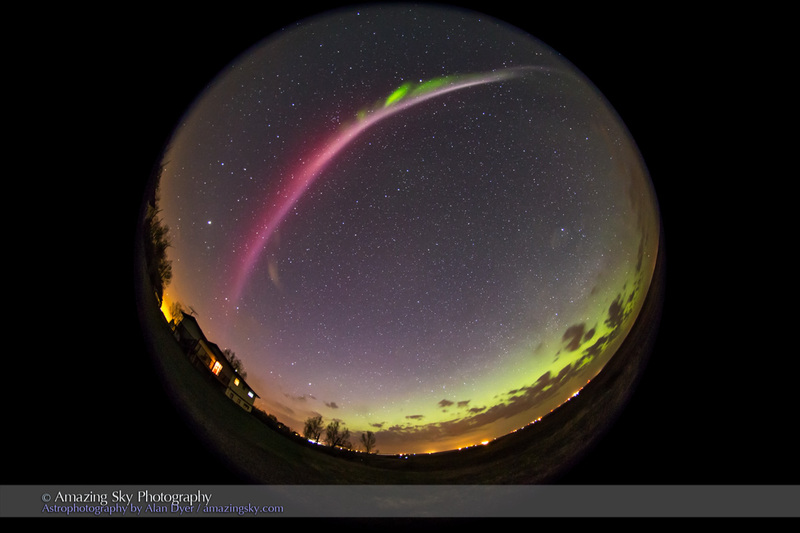 The other images are individual frames taken during the evening, showing snapshots of the red arc development, as it became more narrow in structure and gained green curtain-like fringes. Presumably the red structure was very high in the atmosphere while the green curtains attached to it that did appear hung down from the high-altitude red arc. I shot all images with an 8mm fish-eye lens to capture most of the sky. The camera is looking north toward Polaris, with the Big Dipper almost directly overhead near the centre of the frames. Nicely done Alan. You never cease to amaze some of your followers.